This is not an outfit post. Thanks for all of your comments for my couple outfit and your great wishes to us, so happy to read em' all. It's 30th of July! Guess what? Vacation!!!! I've waiting so long for today. FYI I'll go to Medan and spend my 10 amazing days there. Just can't wait to shop a lot, eat more and get some fresh air. This is not my first time to visit Medan but I just too bored with my long holiday in town so I decided to get some holiday out there. Furthermore, Medan is my hometown too. Wish me have a happy wonderful amazing unforgettable holiday! check this out! www.jiglys.com and don't forget to shop there too. Interviewed by GoldBuffCaramello here! Talk about fashion and my opinion about newbie. Visit her site and read it. Cizzyus Connection, a local online shop that based in Pekanbaru, Indonesia have their Sale Edition and asked me as the model. I'm so glad, here some photos about their collection. Don't afraid, Affordable Price I promise because this is their Sale Edition! By the way, besides Sale Edition they have another promotion too, just like shopping with prize and Ramadhan Collection. Check em' out girls, I think you will love it. 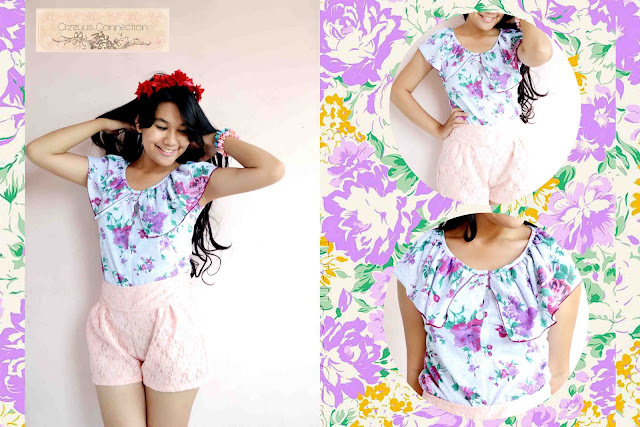 Floral Top with Button also just for 75K!!! Beside clothes, they also sell cute collar just like mine, or wedges maybe if you are a shoesholic? They have a lot of cute wedges and available in many colors. Contact Person : Antonius Manalu/26BBD4E0. See yaaa on my vacation post! wow. your outfits looks amazing and you are a beautiful girl <3 find your blog very interesting. nice blog! let's follow each other? Congrats on the publicity! just stumbled upon your blog and I really love it! You look beautiful and chic!! Love the post and That is really cool for them to ask you to model, you go girl!! Hope you have a great time on vacation! <3 You look gorgeous in that photoshoot. You are cute!!!! love your style!!! really cute outfits! so cute! Congratulation dear! I love that cute pink dress! aww this is soo cute!! nice post. congrats for being featured. Love your blog!!! can't wait to see more!!! Wow lucky you!! Great Pictures! congratulation for you, and I like your style. you're so sweet in floral dress. Hope you have a lovely holiday! Congrats on all the features! wow great photos you look so cute i love the floral dress amazing!!! lovely features!!! have fun on vacation!